Opinions. They abound all around me. 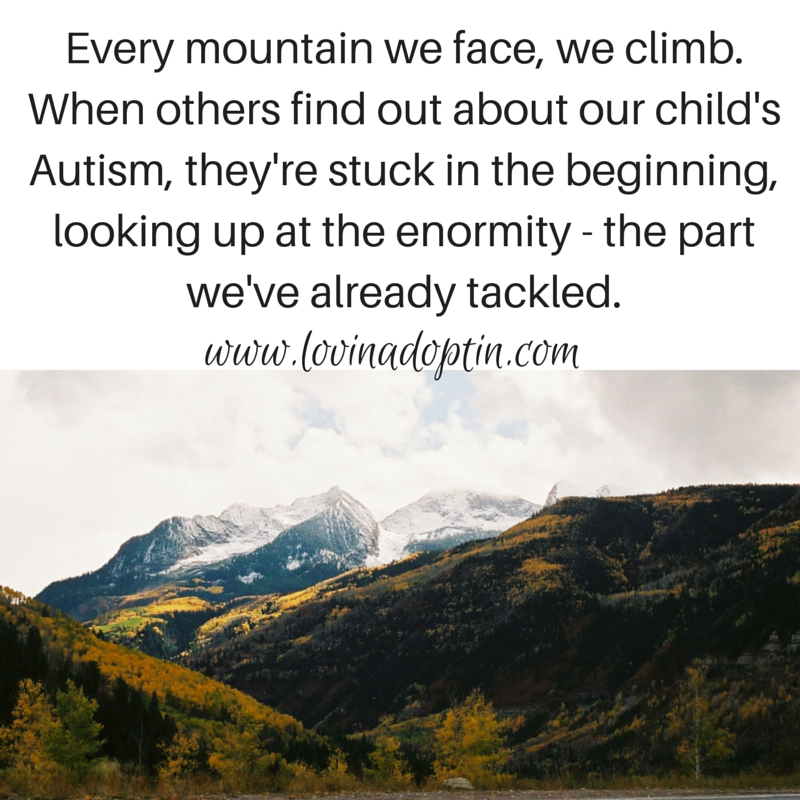 Today I’m talking about parents of children with Autism having opinions. We have opinions and they are usually quite strong, and rightly so, it’s our child, it’s our family. 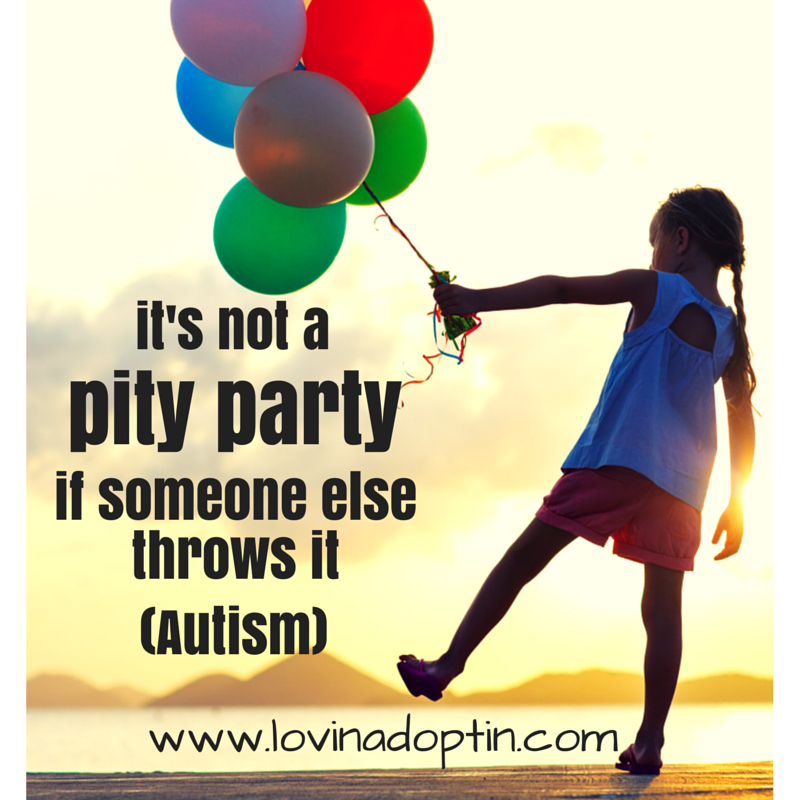 One of the notions I wanted to tackle today is the Autism parents opinion that people shouldn’t have pity, or feel sorry for us and our child. I would like to take a look at why people have pity or feel sorry for Autism parents and their children, and then give you a few ideas to contemplate. they may not understand the Spectrum part of Autism. And it’s very possible that when a mother gives birth to a child who has Autism, or when that child becomes Autistic, they are sad. They don’t immediately see into the future, knowing that they’ll adjust to their new life and it will be okay. Those people who have pity for your child haven’t developed through what you have. We morph with everything that comes along. Every mountain we face, we climb. When others find out about our child’s diagnosis, they’re stuck in the beginning, looking up at the enormity – the part we’ve tackled. What if someone feels bad for my son? It’s okay, because there are days when I feel bad for Jeremiah, so can I understand when someone else does too? I feel bad when he can’t communicate and he’s crying, tears rolling down his face. Or when he can’t explain that he had a nightmare, and I can’t console him because I don’t know about it. I feel bad when he doesn’t understand why we can’t get fries at every drive-thru we come upon. I feel horrible when his sensory needs can’t be met and I don’t know what else to do – I’ve offered spinning, jumping, flashing lights, a quiet room, a squishy toy, and chewy necklace. I feel bad for him often. What about when people show pity for our family? There are days when I feel bad for myself. Sometimes I’m sad that we can’t simply call the babysitter and go out for dinner or a movie. I’m sad when we can’t both attend our daughter’s school event because Jeremiah can’t go. This doesn’t mean I’m sad about my life, it doesn’t mean that I want anything to change – because I would take Jeremiah the way he is over anything I might want to do. But that doesn’t mean that I’m not sad sometimes. If someone else feels sorry for us, it means they have sympathy, they don’t know what it would be like to live in our shoes. I honestly don’t get a lot of pity. Maybe it’s in the way I talk about Autism, or that no one I’ve told really understands Autism (usually that’s the case). I’ve had some wonderful intellectual conversations about Autism. One recently diverted to a story about Rain Man, and I said, “Yeah, it’s a Spectrum, and there’s everything in between.” I didn’t want this guy thinking my son was going to begin quoting the birthdays of every President, Prime Minister, King, and Queen of every country. I wish there was more sympathy for Jeremiah and our family. And maybe there are a few others like us. When we visited my family over Christmas vacation, Jeremiah didn’t receive pity, but was talked to sternly because he was beginning to climb on the t.v. stand (which could’ve held Jeremiah’s weight just fine, but it would’ve gotten scratched). No pity. Jeremiah had also squeezed in between a side table and hutch and knocked over a lamp (it didn’t break and isn’t expensive by the way). The second time he did (before I even had a chance to recognize what was going on – this was ten-minutes after our arrival and seven hour drive) I was told in an austere manner, “You might want to get him out from behind there.” There was no understanding of WHY Jeremiah was trying to get behind the hutch. He was trying to get in a small space and hide. No sympathy. No pity. There’s no pity (or understanding for that matter) coming from the other side of our family. They weren’t able to take care of Jeremiah during Payton’s Christmas school event because of piddly reasons they could’ve done the following night, one family member added, “He (Jeremiah) needs to learn to be in society.” I laugh (instead of crying – which I do plenty of) because this person has never taken Jeremiah INTO society. There is no sympathy for our family. When people feel sorry for us or show pity, it’s often because they feel they couldn’t do what we do. The truth is, some could and some couldn’t. People say, “I do it because she’s my child, and I would do anything for her, just as you would if it were your child who was diagnosed.” That may be true for some, but not for others. We all handle adversity differently. I can say the only reason I can do what I do, is because I have an extremely supportive husband. Yes, we have disagreements (okay fights – but it’s mostly me doing the fighting), but overall my husband is my rock. Could I do it without him? Maybe, but I know it wouldn’t look like it does now, not even close. It’s always pained me when I hear others say they don’t want people’s pity or don’t want others to feel bad for them (as I think there is a sliding scale, but it’s hard to tell sometimes where someone stands). Often people say, “I’m so very sorry,” because they don’t know what else to say. We received many of those comments when Jeremiah was first diagnosed, and I was okay with it to some extent. I was still trying to accept a new diagnosis and a new way of life, and they didn’t know what to say. They assume it isn’t what I expected. I would love to hear your experiences of people feeling bad for your child and your family. Share how you feel and what you do about it. You can receive each post made to Lovin’ Adoptin’ by subscribing in the upper right corner. If you’re on a mobile device, you can do this on the web version. You can also “like” my page on Facebook and follow me on Twitter and Pinterest for more helpful information and links. This entry was posted in Autism, special needs and tagged feeling sorry for family with Autistic child, having pity for family who has Autistic child, having pity on Autistic child, how does Autism parent handle someones pity?. Bookmark the permalink. Because M2 is high functioning my family struggles hard with realizing she has limitations. The public tends to judge me as an overly permissive parent but when they get to know us they realize I am no where near there. When people tell me “your life must be SO HARD” I say “everyone’s life is hard.” I know they mean well but don’t know how to be supportive. I have learned to let a lot go but you are right some days I do feel bad for me and my child.